DSTB stands for Dial Side True Beat. The true beat seconds (or dead seconds) is an horological complication where the hand jumps forward when one second has elapsed. 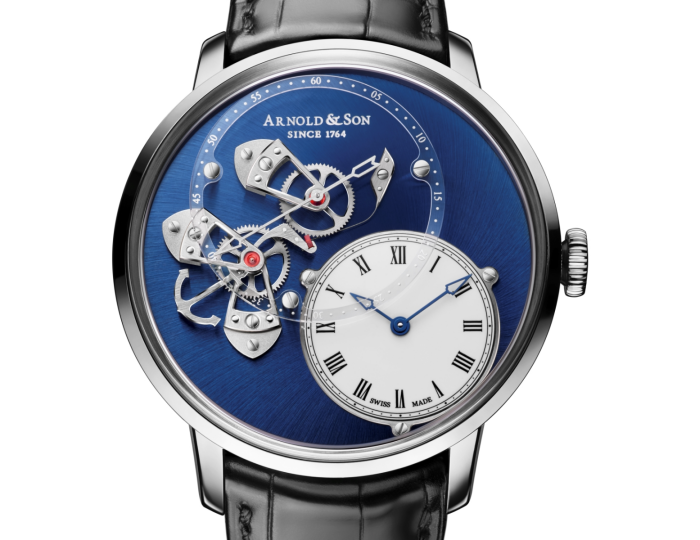 The automatic movement showcases the true beat seconds’ mechanism entirely on the dial side. Not just the hands, but also the lever, wheels and three palladium treated true beat seconds bridges are located in all their beauty on the dial side. Making the watch even more alluring is the fact that the true beat seconds lever is shaped like an anchor – paying homage to Arnold’s maritime achievements.